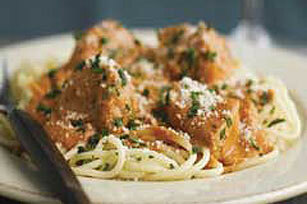 Cream cheese, tomato sauce and seasoning blend deliciously in this pork-and-spaghetti dish. Top with Parmesan and fresh parsley for the win. Heat dressing in large skillet on medium-high heat. Add meat and garlic; cook 10 min. or until meat is done, stirring frequently. Remove meat mixture from skillet; cover to keep warm. Cook spaghetti as directed on package. Meanwhile, add tomato sauce and seasoning to skillet; cook 5 min. or until heated through. Add cream cheese; cook on low heat until melted, stirring until melted. Return meat mixture to skillet; cook 5 min. or until heated through, stirring occasionally. Drain spaghetti; place on platter. Top with meat mixture, cheese and parsley. Add 2 cups frozen peas to sauce in skillet with cooked meat mixture. Continue as directed. Substitute crushed red pepper for the Italian seasoning.